Villa del Pescatore Allegro "House of the Happy Fisherman"
Mid-Century, Old Florida at its best! Beautiful 3 bedroom, 2 bath private home with water views everywhere! This home is situated on one of the most desirable locations in this area. We are located in the City of Riviera Beach on the South side of the Blue Heron Bridge. 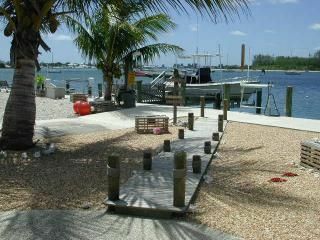 With our Southern exposure we are overlooking Peanut Island, the Palm Beach Inlet and all of the Marinas across the bay. Watch all of the action as cruise ships head for the Bahamas, or the wave runners, sail boats and paddle queen have their daily fun. Fish right off of your own dock. Rent a small boat and snorkel & play off of the spectacular sandbar between your house and Peanut Island. Drift fishing and scuba trips within walking distance. A short walk or drive and you will be at one of the most beautiful beaches in Florida or enjoying lunch or dinner at the Buccaneer or Sailfish Marina. Or take a tour on the Water Taxi to Peanut Island and Palm Beach. Within minutes to Worth Avenue, Antique Row, Gardens Mall, City Place or Roger Dean Stadium. Newly decorated and stocked with all of the modern amenities that you will need to make this your perfect vacation home getaway. Fully furnished and awaiting your arrival, just bring you suntan lotion and leave your worries behind. This is truly one of the most beautiful vacation homes in this area. Much more... e-mail for more info. Seats 6 comfortably but 8 can fit if needed. Home and driveway are all on level ground with easy access from driveway into home. There would be just a standard 3inch to 4inch door threshold to go over. Air-conditioning, hot-tub, jacuzzi, BBQ grill, outside afterswim shower, washer, dryer, linens, dishwasher, telephone, microwave, toaster, coffeemaker, dishes/utensils provided, cable TV, VCR, DVD, Stereo, CD player. This is the most perfect home for a Florida vacation. There is a large outdoor sun patio, fishing dock, fountains, soaring pelicans and seagulls. You will not find a more charming or exciting location. Also available for an additional charge is daily or weekly housekeeping. This is a non-smoking home. This place is adorable and it is a MUST to visit. We had such a great time at the Mulay’s getaway. It has absolutely everything in it. The Mulay’s are so welcoming and always available if you have a question. We would absolutely come back and stay at their place again in the future! Loved it! This is an amazing home furnished comfortably and beautifully decorated. Everything you could possibly need is provided.The owner is wonderful and goes above and beyond to make you feel welcomed. Can’t wait to visit again. We had a blast! The owners were friendly very helpful. They greeted us when we arrived, showed us around and left water and cookies for the family. They had shark teeth and dinosaur gifts for my son. The owner's brother purchased a brand new fishing pole and a ton of fishing lures for my son to use during our stay. They had a wall full of fishing gear for the adults to use as well. The home is located a minute from the bait and tackle shop, the supermarket and 10 minutes from target/Wal-Mart. Fishing was epic- we caught fish everyday! We couldn't have asked for a better location to enjoy our summer fishing vacation. We had a wonderful and exciting experience! The house had plenty of room and is beautifully decorated. The location is absolutely beautiful and conveniently close to restaurants and the grocery store. We couldn’t believe the amount of waterfront and the view was breathtaking. We were able to easily hop on and off the boat right at the house. It was wonderful to have Shatee and Jerome right next store. They were very kind, brought the children shark teeth and are very knowledgeable about the area. We felt very comfortable and hope to be back next spring! We are so please that you, your friends and kids had a good time. It was actually enjoyable for us to see all of you out there every minute of every day running around, fishing, paddle boarding, boating, grilling out and really enjoying the property and making such fun memories for the children. Which by the way were the cutest and most polite kids that I have seen in a while. And I have to admit that I was pleasantly surprised that with 8 people how clean and neat you left the home. You guys were awesome and are welcome back any time! The photos do not do it justice - the view is a living postcard of boats, pelicans, jumping fish. Shantee and Jerry are fabulous owners - genuinely welcoming, we had everything we needed for us and to host friends & family. Huge Publix just around the corner. A piece of heaven on earth with daylong sunshine. Loved it beyond expectation. Thank you Wendy for choosing our home. You and Dan were the perfect guest and I am really happy that you both enjoyed your stay. And thank you for leaving the home in pristine condition. We hope to see you both again in the near future. Great property, great owners, perfect location. The owners of the property came by to check in on us and showed us around the home. Let us use their fishing gear and the bait shop was a block away. Jet ski and boat rental 50 feet from the house too. They even left us a basket full of soaps, tooth brushes, and other things which came in super handy when one of us realized we forgot our whole toiletry set at home! Thanks Jerome and Shatee! David, I am glad that you and your friends enjoyed your stay. I was a little concerned when I saw 4 single men show up, but you guys were very quiet and respectful of the home and we were glad to have you. Also, I really got a kick out of seeing those two beautiful race cars parked in the driveway that you had transported down here from Chicago for your race at The Palm Beach International Raceway. Weekly Rate: $1600 - $2100 In Season $ 425. per Night Minimum of 3 Nights (Nov 15 thru Apr 14) $2,100. Week $6,800. Month Off-Season $ 350. per Night Minimum of 4 Nights (Apr 15 thru Nov 15) $1,600. Week $5,200. Month Rates are based on six or less overnight occupants. Additional guest $50. per night $500. Security Deposit. Includes all utilities, cable and local phone service. House is large enough to accommodate 2 families. Max of 4 Adults 8 Beds Total Small Dog welcome with additional pet fee of $200. End of stay house cleaning extra. $150. for 1 week. $175. for 2 weeks. $250. for a 1 months stay. This is an upscale, newly decorated home. Your well-behaved children are always welcome. PLEASE NOTE: We are in a mandatory evacuation zone. In the case of an approaching storm or hurricane, or our area has been issued an evacuation notice, we will need to start boarding up and preparing the home. Under this situation you will need to pack up and leave the home or area. We will refund you for the unused remaining days of your stay only. And if your boat has been docked on our property, you will need to remove it promptly or have it dry docked per our local storm rules. Thank you for your compliance in this emergency situation.